A Web site that makes personal training available to exercise novices in their own homes. A Facebook app that offers one-on-one tutoring and keeps track of students’ coursework. An organization that enables college students to bring their love of science to classrooms in public schools across the country. A sandwich company that delivers one meal to a homeless person for every sandwich it sells. Bella Frankel presents her idea—a comparative shopping search engine—before the judges at the Fast-Pitch Competition. 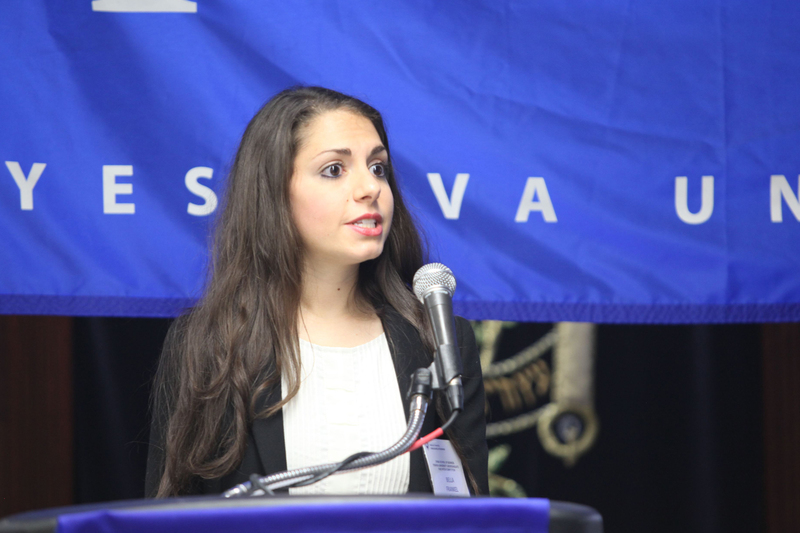 These were just a few of the ideas in the running for the grand prize at the 2012 Ira Rennert Entrepreneurship Institute Fast-Pitch Competition, presented by Yeshiva University’s Sy Syms School of Business on May 9. Ten student finalists brought their innovation, individuality and strategic thinking to bat as they competed for three top awards. Each finalist presented a business model before a panel of seven judges, comprised of business executives, venture capitalists and entrepreneurs. 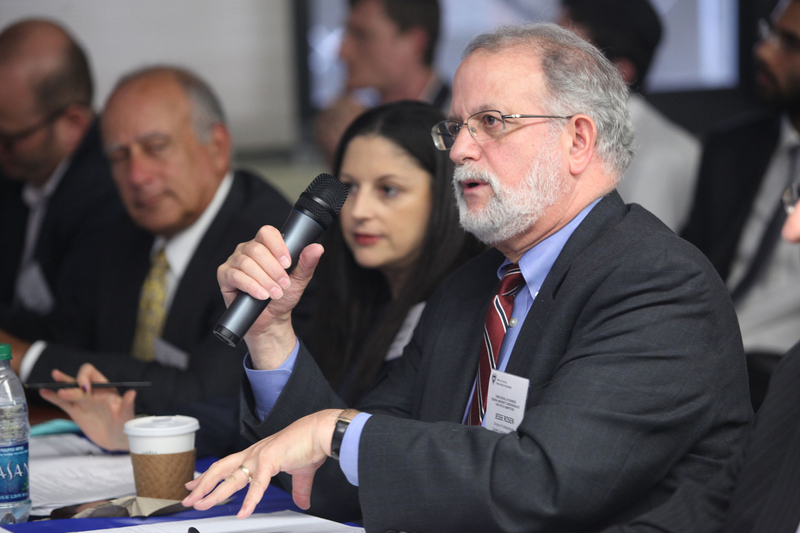 Judges offered comments and insight, suggesting ways to strengthen weak spots in students’ plans and take their ideas to the next level. Business executive, Jesse Rosen, and a team of judges offered presenters feedback on how to take their ideas to the next level. 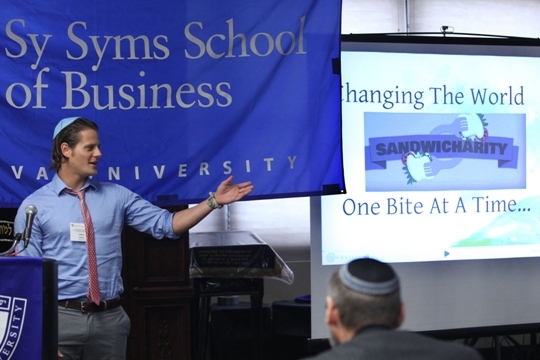 Omer Haim pitches his business, Sandwhicharity. The grand prize, a check for $1,000 and more time to flesh out ideas with the judges, went to an organization that aligned with those values perfectly: Saves By B, a sneaker company formed by Zachary Charles ’12SB and his teenage brother that sends an identical pair of shoes to children in need for every pair ordered on its website, savesbyb.com. The company has been featured on New York 1, dosomething.org and other media outlets. “It was an honor to win. There were a lot of great ideas and to be voted the best is a great accomplishment for me as well as Saves By B,” said Charles, adding that the money would go towards the next shipment of shoes, which will be in different colors. “I learned a lot yesterday, especially about different marketing styles and strategies. Listening to all of the competitors and hearing what the judges had to say about them was helpful as well because I was able to take some of the information they gave them and tie it into my business. Two runner-ups tied for the second place prize of $750: Sandwicharity and START. Grafi Salads, a preservative-free Mediterranean salad company started by Tal Grafi ’12SB, won third place and received $500. In addition, Dr. William Schwartz, former vice president of academic affairs at YU and founder of the business plan competition, was presented with an Award for Entrepreneurship Service by Dr. Fred Palumbo, professor and area chair of marketing and management. Other organizers of the competition included Michael Strauss, associate dean and entrepreneur-in-residence at Syms, and the Business Management Club.